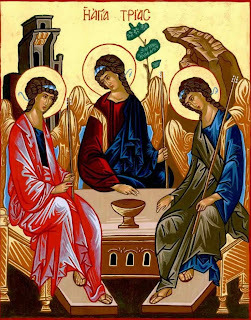 The Feast of the Most Holy Trinity is a double feast and its liturgical colour is white. Today is also the first Sunday after Pentecost and the Sunday is commemorated at Mass and in the Office. The Octave of Pentecost ended with the celebration of the Ember Saturday Mass after None. At first Vespers yesterday afternoon the Office was proper with the antiphons Gloria tibi Trinitas etc sung, doubled, with Pss. 109, 110, 111, 112 and 116. 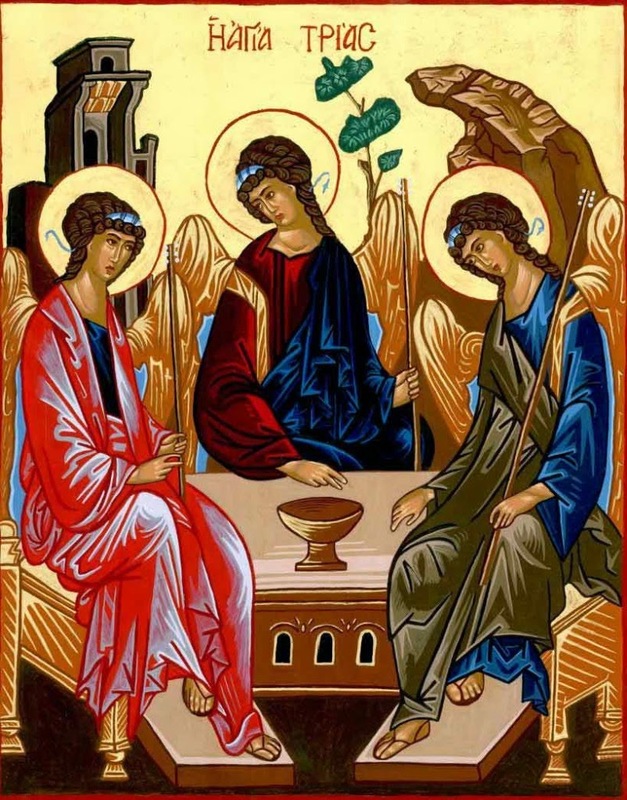 The chapter, O altitudo, and hymn, O lux beata Trinitas, will both be used at Vespers on Saturdays for all the Sundays after Pentecost when the following Office is of the Sunday. The antiphon on the Magnificat, Gratias tibi, Deus etc, and the collect, Omnipotens, were proper to the feast. After the collect of the feast a commemoration was sung of the first Sunday after Pentecost. After Vespers the antiphon Salve Regina was sung for the first time this year. At Mattins there are three nocturns. The invitatory is proper, Deum verum, unum in Trinitate, et Trinitatm in Unitate, Venite adoremus. The hymn is Summae Deus clementiae. In the first nocturn the antiphons Adesto unus Deus etc are sung with psalms 8, 18 & 23. The lessons are taken from the sixth chapter of the Prophet Isaiah. These are identical to those found in the 'modern' books. In the second nocturn the antiphons Te invocamus etc are sung with psalms 46, 47 & 51. The lessons are taken from the Book of Bishop Fulgentius on faith. The fourth lesson continues with Si enim, sicut et Patris...veraciter Trinitas diceretur. The fifth lesson begins Rursus quidem Trinitas...and continues Per hanc unitatem...totus quoque Spiritus Sanctus in Patre et Filio. The sixth lesson begins Nullus horum and continues past the ending found in the 'modern' editions with three more sentences Sicut ergo...est trium personarum divinitas. In the third nocturn the antiphons Caritas Pater est etc are sung with psalms 95, 96 & 97. The lessons are from a homily of St. Gregory Nazianzen. These are again slightly longer than those found in the later editions. The seventh lesson continues Nec extensionem...atque potentiae credimus. The eighth lesson begins Et ideo unum... and continues Sic est Apostolus...per quem omnia et nos per ipsum. The ninth lesson is of the first Sunday after Pentecost, it ends slightly before the version in 'modern' editions with Ego sum panis vivus, qui de caelo descendi? The Te Deum is sung. At Prime the festal psalms are sung (53, 118i & 118ii). Quicumque is sung after the last stanza of Ps. 118. The Athanasian Creed is sung on all Sundays when the Office is of the Sunday unlike in the later, reformed, versions of the rite. The Dominical preces are omitted. At second Vespers the antiphons Gloria tibi Trinitas etc are sung with psalms 109, 110, 111, 112 & 113. The chapter is O altitudo and the Office hymn O lux beata Trinitas. After the collect of the feast a commemoration is sung of the first Sunday after Pentecost. At Compline the Dominical preces are omitted.